Lac Trouser is a colorful mixed media painting. 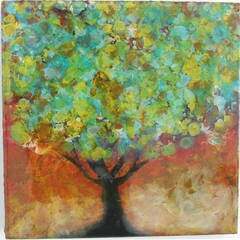 It is oil and pigment on Wood Panel with a high gloss finish. 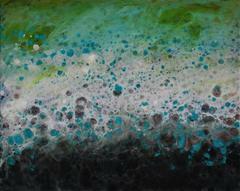 This diptych is 20x40. Canadian artist, Marie Danielle Leblanc, was born in Trois-Rivières (Quebec) and has lived and worked in Montreal (Quebec) since 1990. Her paintings transform landscapes into poetic worlds. Her deeply saturated palettes bring new life to the sea, land and sky. And she transports her viewers to timeless and imaginary landscapes. These are the last in this series of abstracted landscapes and features work from her Nepal travels and world travels. During her travels, she likes to write down her thoughts, make a note of the weather or the name of a place, take pictures and collect images. Leblanc’s travel diary is an ideal instrument for her. Whether she is driving on the highway or in the open country, walking on never-ending beaches or rocks stroked by the sea, it is through her travels that the artist captures landscapes that stretch into the vista. She has participated in twenty solo exhibitions, and more than fifty group exhibitions. Her work has also been shown throughout Canada and in Paris, Sydney, Mexico and Tokyo Marie Danielle applies a finishing hi-gloss varnish to all her paintings. It allows the rich colors to become even more vibrant and you can see the undulations of where she dripped, dropped and moved the paint to create her abstracted landscapes. The edges of each painting are painted using a black tar, continuing the organic feel of her work. Most clients leave her work unframed, as it looks very finished against the wall.